This weekend in Galway, Ireland, a woman was killed by a number of dogs, while visiting a relative’s home. Reports are incomplete and few details have been confirmed; there has been much speculation and sensation raised around this incident. This is the first bite related fatality recorded in Ireland, and has shaken many, including us at AniEd. When ever dogs are involved in hurting a person, it is terrible; the victim and their family and loved ones are gravely affected, often for the rest of their lives. Although very rare, when deaths occur, I can’t imagine the pain experienced by all who knew and loved the victim, and by those who attended the scene of the incident. We have tried to produce a non-inflammatory statement but it is a drop in the ocean relative to the highly sensationalised and panic-inducing sound-bites produced by many dog-pros, politicians, and others. Headlines and click-bait do not further our cause in education, and I urge you to please use caution when sharing and commenting. It is genuine education that will improve safety for both pets and their people. Our statement can be read here. In it, we refer to valid research looking at the contributing factors associated with fatal dog attacks, with a complex combination of factors found to be contributing to 256 fatal dog attacks in the US over a ten year period. Dogs are predators, have big teeth and powerful jaws and live with humans. When people say that the dog is ‘unpredictable’ or the attack was unprovoked they are attempting to interpret complex behavioural patterns, inaccurately for the most part. Relative to the amount of contact we have with dogs, and despite the weaponry dogs possess, we get bitten rarely, and when we do get bitten, serious injury is very rare. Fatalities even rarer. Calling for stricter legislation in relation to dog behaviour is nonsensical and a waste of public funding – this is not a big enough problem at societal level. Investing in education programs, for pet owners and professionals, to help ensure that risk factors in relation to dog behaviour are minimised, is a better approach likely to yield greater success. The most influential factor in dog bite incidents is human behaviour (and we are not talking about victim blaming here). Dogs are not unpredictable, they act like dogs each and every time. Behaviour is complicated – generally speaking there are a number of factors influencing behaviour at any one time. Dogs may aggress because they are in pain or uncomfortable, affected by a neurological disorder or other disease process. Dogs recovering from surgery, on medication, developing senility, going blind or deaf, having a seizure will have an altered view of the world and may be more likely to bite. If a dog is in poor health, perhaps malnourished, kept in an unsuitable environment or isolated, this will certainly contribute to their discomfort. Dogs are dogs but the world we keep dogs in has changed and drastically so – we don’t do a great job of helping dogs keep up with these changes. When we have difficulty analysing a behaviour and pinpointing some sort of cause we often fall back on ‘genetics’. Selecting for a tendency to shyness or being ‘highly strung’ certainly doesn’t help, but all behaviour, and I do mean ALL behaviour, is a mix of genetic and environmental influences. Just because you carry genes for some characteristic doesn’t mean you express that trait. Not a whole lot of behaviour in dogs is linked with high heritability, because behaviour across a population is strongly affected by environmental conditions – i.e. how people have intervened in the producing, rearing, caring and safety for the dog. Dog communication is all about avoiding aggression so if uncomfortable they aim to increase distance. Not so surprisingly, distance increasing signals are used to ask for time, distance, relief from social interaction. Distance increasing signaling is subtle and needs to be learned – we are not born with a natural, mystical ability to speak dog. Some of our favourite resources on this topic: iSpeakDog, and these clips: part 1 and 2. Puppies need to have lots and lots of positive exposure to all sorts of situations within their first few months of life. Positive exposure must continue for the remainder of the dog’s life especially to counter any bad experiences they may be faced with; this is particularly important during adolescence when crucial development continues. A puppy’s socialisation experiences must suit the genetics that they come with (so look at type and parents’ behaviour) and to make up for any socialisation-gaps in puppy’s rearing environment. Bite inhibition refers to how puppy uses its jaws and pressure, in social situations. It is suggested, although not verified by reliable research, that this will affect the amount of damage the dog will do during a biting incident. Bite inhibition is acquired during puppyhood, probably in the first weeks of life – puppy learns how to use his pointy little teeth in social situations. Puppies spend their time within their litter, biting and chewing on one another, learning how to give and take. Puppies will also practice on humans, a common gripe among puppy owners. Any bite inhibition acquired, probably happens in puppy’s first 7 weeks, and there may be genetic factors too. When a dog bites a human, they don’t always cause damage, and something cause only minor damage – this is a pretty mean feat, given the impressive weaponry dogs have. It is due to the dog inhibiting the force of its bite. We grade bites on a Bite Scale, measuring the damage done to the person, e.g. Dunbar Bite Scale. Bite threshold refers to how quickly and how likely a dog will be pushed toward biting. What type of warning behaviour does the dog display? Do they skip from growling straight to biting or do they jump from hard staring to snarling in the blink of an eye? More from Reactive Champion on the bite threshold model. The Ladder of Aggression similarly illustrates canine stress-related behaviour and can be used to help pet owners better understand how canine behaviour may escalate. More on the Ladder of Aggression here. The Bite Threshold model illustrates the effects of cumulative stimuli, that elicit emotionally driven behaviours, such as happiness, excitement, fear and aggression. Stress is caused when the body must adapt to environmental conditions; the dog may use behaviour to cope with these challenges, to minimise the effects of the stressor. One stressful event won’t always cause a dog to bite – stress begets stress and often times a dog doesn’t get the opportunity to get over exposure to one stressor before exposure to another. The manifestation of this is often referred to as trigger stacking; more here. Arousal increases, the more stressors the dog is exposed to, and as they become more wound up they are less well able to control themselves. As arousal increases, inhibition decreases – the dog may bite harder, jump up more strongly, may be less responsive to cues or even physical interventions. Arousal increases in relation to emotional events, and not just negative feelings, but also happiness, excitement. A dog’s past experiences with people affect his attitude – have people used harsh training techniques, harsh training equipment, hugged the dog, frightened the dog in the past? Has the dog been confronted, challenged, intimidated or frightened and then delivered a bite? Dogs are always been trained; learning about how to cope with their environment, via their environment. Our behaviour, and how we interact with dogs, is a pretty big (HUGE!) part of the environment that will teach that dog which behaviours work, and which don’t. If a dog is regularly put in situations where they feel they must use distance increasing signaling, they are learning that’s what they need to do to stay safe. Looking at the Ladder of Aggression, if dogs learn that orange and red behaviours gain them relief, that’s what they’ll use; what’s more, they will stop using the green and yellow ones, because those don’t work for them. When we punish warning behaviours, we are teaching the dog that it’s not safe to warn, but not helping them feel any better about the situation (and the person) so the dog still wants relief. Except, we may have just taken the batteries out of our smoke-alarm…a dog that doesn’t warn, and just bites. Interactions with people that cause dogs to have a negative experience may contribute, but also may insufficient exposure. A dog who is isolated from the world, who isn’t around people, having positive interactions, in the contexts in which they are expected to live, may also find it difficult to cope. Indeed, people will usually presume that a dog is showing fearful or aggressive behaviour because they have had negative experiences with people, e.g. abuse or neglect. While that may be true, it is just as likely that the dog is behaving this way because he hasn’t had sufficient positive, appropriate interactions with humans in different situations. A dog behind a barrier (real or perceived) who can’t get to or away from something will be frustrated. Frustration has to be released somewhere and without acceptable outlets for this a dog may redirect their frustration on a person. A dog may aggress if he feels that his possession of some resource is threatened. This may include a mother dog that bites when she feels her babies are in danger, a dog who threatens when someone approaches his food bowl or yummy bone or the dog who growls if moved off the sofa. All animals resource guard (you locked your house and car today, right?!) but inappropriate and unacceptable manifestations of this behaviour are commonly seen in biting incidents. Lots of people think that it’s OK to hug, grab, lift and restrain dogs – actions they would never carry out on a person they don’t know well but happily cross that line with dogs they have just met. Indeed, most people bitten are bitten by dogs they do know; dogs don’t really appreciate this type of contact even with familiar people, especially if they haven’t been taught to tolerate or enjoy it. Dogs are interested in things that trigger predatory behaviour – throwing a ball, playing chasing, sniffing and sniffing all stimulate this tendency. Dogs are predators and like other innate behaviours that come inbuilt with dogs, if predatory behaviour doesn’t have an outlet it may be expressed out of your control. Predatory behaviour may be behind dogs chasing and attacking smaller dogs, other pets and even children. Running, jumping and squealing may trigger this behaviour. 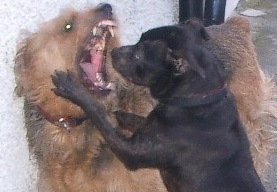 A group of dogs is more likely to do more damage than a solo canine, not just because there are more mouths of teeth. A group of dogs may take cues from one another, arousal and competitiveness is likely to be higher and as such behaviour will escalate quicker. Has the dog bitten before? Has the dog shown aggression before? If so what happened and how has the situation been managed since? A dog who has shown aggression before in a specific situation is very likely to do so if in that situation again, where nothing has been done to help the dog to cope. If the dog has bitten before, how much damage was done to the person? The vast majority of bites inflict little damage, especially relative to the weaponry dogs have – dogs have the tools designed to kill other animals. The level of management, skill and knowledge required to effectively and appropriately deal with dogs who have or are likely to demonstrate aggressive behaviour is massive; to such an extent that is underestimated. Without careful environmental change, the dog is likely to bite again. Even with careful management, the dog may bite, as management is only one part of the process (a very important part albeit). Dogs are more likely to bite children – therefore, child behaviour needs to be considered a major contributor. But of course, children can’t be expected to regulate their behaviour too well – a bit like dogs that way! Adults need to be there – direct supervision and management are the keys. Applied diligently, we could reduce bites to children dramatically. If you want to learn more about helping parents, pet owners, children and dogs be safer, ask us about webinar: Kids & K9s. Dog behaviour is contextual; meaning that behaviour occurs due to the presence of specific stimuli. If we want to truly understand the contributors to biting behaviour, we must understand the specific and general context (distant and immediate antecedents). To truly understand the conditions leading to a bite, we need to know more than just the damage caused by the bite, or the warning behaviour demonstrated – we need to know about context. What has contributed to this behaviour in the seconds, minutes, hours, days, weeks and even generations before the incident? select a type of dog that suits your lifestyle – can you meet the dog’s needs? look for non-confrontational ways of interacting with your dog – don’t worry about dominance! But where is ‘breed’ on this list? Breed considerations are just not as important as these other factors. Does it play a role? Absolutely! Aggression is behaviour, influenced by many internal and external factors, so let’s concentrate on behaviour, not breed or not the dangerous-dog-au-jour. For more on understanding the complexities with understanding behaviour and breed advocacy see: Beyond Breed.